Hotel SY La Terrasse, perfectly located on the front of the Basilica of Vézelay is the perfect place for a weekend or a holiday in this historic village. Completely renovated in 2014, the hotel features the Restaurant SY La Terrasse on the ground floor, 6 rooms distributed in 2 floors and two terraces, one more secret, the second in front of the imposing Basilica. We invite you to discover our 6 beautiful rooms : located to the monument, they offer a unique perspective on Vézelay and its Basilica. 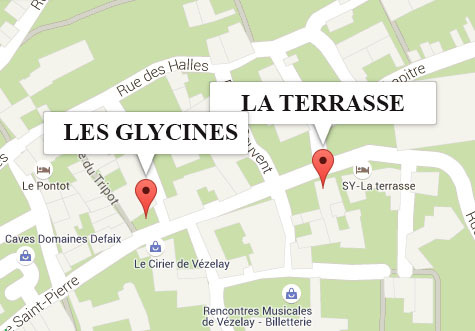 If you are looking for a hotel in Vézelay, SY La Terrasse is the perfect place. Below, you can check the availability of our hotel and you can book directly. By clicking on the button you can have a close look at each room for your easy selection. There is no better terrace in Vézelay to enjoy typical burgundy lunch or dinner, tea, coffee, ice cream or a pastry. We take care to select the best producers respectful of a quality charter mainly BIO. Imagine the pleasure of having lunch under the shade of large umbrellas and having in front of you the Basilica! Vézelay and the Morvan are full of hiking trails in addition to the prestigious French way of Vézelay (or via Lemovicensis) to Saint-Jacques de Compostela (923 km – 36 days walking). Hotel Restaurant SY La Terrasse, located in the heart of the charming town of Vézelay in Burgundy will facilitate your escapades.